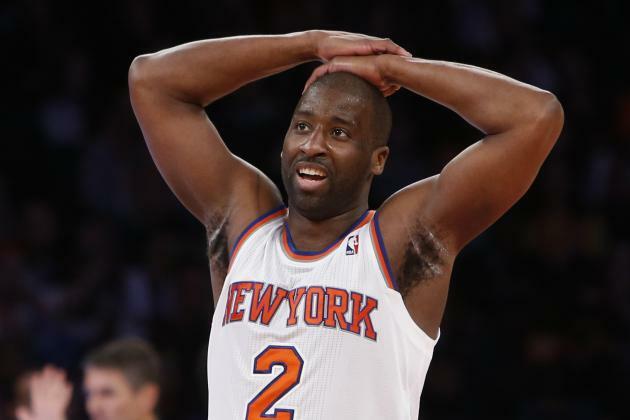 New York Knicks point guard Raymond Felton was arrested on Tuesday on felony weapon charges after his estranged wife’s divorce lawyer handed in an unregistered loaded handgun belonging to Felton. Only hours after their heartbreaking loss to the Dallas Mavericks at the buzzer, New York’s disappointing season took another undesirable turn after struggling point guard Raymond Felton was arrested on weapon possession charges early Tuesday morning. Felton’s wife Ariane Raymondo-Felton, who who filed for divorce from the Knicks’ guard last week, accompanied by her attorney, handed in Felton’s unregistered high-powered FBH 5.7 x 28mm semi-automatic handgun over to police Monday, stating she did not want the weapon in the couple’s apartment, a law enforcement official said. At the time of the handover, the weapon was loaded with 18 high-velocity rounds, the official elaborated. Felton first tried to handover the firearm to his divorce attorney Michael Stuntman, who declined to take possession of the weapon. “I don’t think anybody is allowed to posses an unregistered, unlicensed firearm in the city of New York so certainly anyone who offers one to me will be told politely but firmly no thank you,” Stutman said. While she insisted Felton had never threatened her with the weapon, Raymondo-Felton told police at times he had held the gun when the two had argued. Felton was arrested at 12:50 am Tuesday morning after turning himself in to New York Police, and was held on charges of criminal possession of a weapon in the second, third and fourth degrees. He appeared in court Tuesday morning and was formally charged with one count of criminal possession of a weapon in the third degree and one count of criminal possession of a firearm. Both of which are considered felony charges in the state of New York. Felton was given a six-month order of protection from his wife and his bail was set at $25,000. He has since posted bail and is now clear to travel with his Knicks teammates. Felton’s case has been adjourned until June 2. The Knicks’ burly point guard is not the first New York-based athlete to find themselves foul of the law due to firearm charges. In 2009, New York Giants wide receiver Plaxico Burress was sentenced to two years in prison after a gun tucked into his waste band went off in a night club and shot him in the thigh. Felton signed a three-year, $10 million contract with the Knicks in 2012. However, his play has been disappointing this season, averaging only 10.4 points and 6.0 assists per game while shooting a paltry 40.3% from the floor and 29.6% from deep. New York tried unsuccessfully to trade Felton before this season’s February 20 trade deadline.